The Eleventh North Carolina Workshop with Yuan Zhou was held December 8, 9 & 10, 2017, in Raleigh, North Carolina. These Yuan Zhou Workshops just keep getting better and better. Yuan Zhou 7d is a well known and highly respected Go workshop teacher. Members of the Triangle Go Group have benefited from his workshops for over 10 years, and still find his teaching fresh, inspiring and valuable. Shifu Zhou provides more than proper play guidelines, sharing insights into the philosophical depths of the ancient game. As he reviews attendee's games he tailors his instruction to each individual and clearly shows how correct play leads to good results. Teacher Zhou explains common patterns with easily remembered expressions, such as "sheng bu si" translated as "sometimes, living is not as good as dieing," emphasizing the value of a well considered sacrifice. Yuan Zhou excels at explaining Chinese language phrases and meanings relating to Go. This year, in addition to sharing many new expressions, he shared some of the meaning of professional 9 dan Tang Weixing's name (唐 韦星), tracing the surname Tang back to the seventh century A.D. Dynasty, and the meaning of xing as a celestial star. On Friday, participants played games for review and analysis on Saturday. Five of our players paired with five members of the Vermont Go Club, and Yuan Zhou relayed our moves on the KGS Go Server with remote participants in Vermont, Chicago and Hawaii. The rest of our onsite participants played each other. 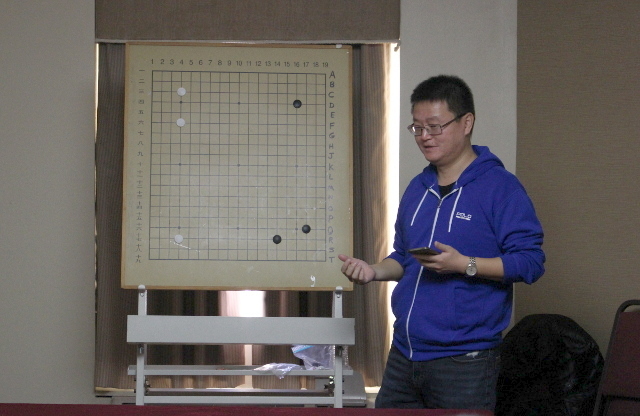 A highlight of this year's workshop was shifu Zhou's review of a game from this year's CCTV Cup, between professional 9 dan Tang Weixing and 5 dan Peng Liyao. Many current professional games are already exhibiting moves favored by Go Seigen and popularized by AlphaGo, and Yuan Zhou explained the meaning and utility of these moves. As ever, shifu Zhou's workshop educated and inspired the lucky participants, and left us looking forward to his next appearance in the Triangle. Yuan Zhou is an authority on the famous Go player Go Seigen, and continues to write books about the man known as the strongest player of the 20th Century. Yuan Zhou also continues to write books on new players and important games, adding to his library of excellent books and study guides. The workshop was sponsored by the Triangle Go Group of North Carolina. Yuan Zhou (American Go Association 7 dan) was born in Tianjin, China. Tianjin is a major city in the northern part of China, near Beijing. His father taught him to play Go at the age of six, and a year later he won the Tanggu District Junior Go Championship. After this auspicious beginning, Zhou began professional Go training while he was still seven years old. He was twice invited to represent Tianjin in the All China Prodigy Cup. In 1989 Zhou immigrated to the USA and joined the American Go Association (AGA), becoming a US citizen. Zhou earned a BS in Electrical from the University of Maryland, where he was also president of the University of Maryland Go club. Afterwards, he became increasingly involved in AGA events, winning many Go tournaments. Please see the list below for Yuan Zhou's 30 US Go titles. Zhou also served on the AGA Board of Directors in 2005-2007. Zhou is one of the top competitors on the American Go scene, winning the Eastern US Open, one of the biggest US tournaments in 1992. He also won New Jersey Open, one of the biggest US tournaments, four times. Twice he has also won the Maryland Open, another major tournament that attracts strong players. Zhou is regularly invited to play in the North American Ing Cup, which involves the strongest US players, and the North American Fujitsu Qualifying Tournament, which also includes pros. In Zhou's Go career, he has defeated pros many times, including three times in even tournament games: Hak Soo Kim 6p in the 1996 Fujitsu, Xuefen Lin 1p in the 2001 Eastern Oza and Huiren Yang 1p in the 2009 North American Ing Masters. In 2004 he won the US Ing Redmond Cup and with Kristen Burrall as partner, the US Pair Go Tournament. He and Burrall represented the US in the 15th World Pair Go Championship in Tokyo. 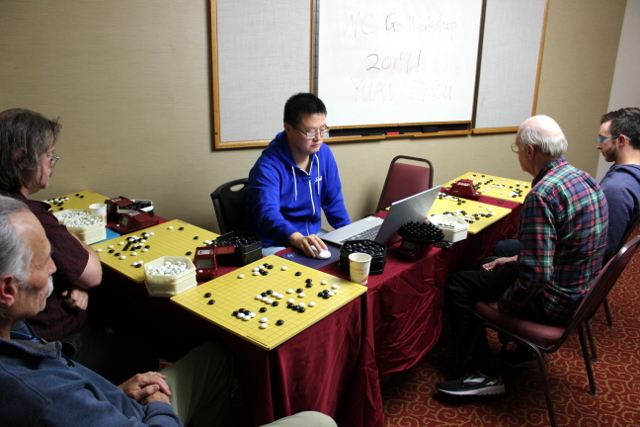 Zhou represented the US again in the 20th World Pair Go Championship in Tokyo. Zhou was also the US representative in the 3rd World Student Oza in Tokyo. In 2009, Zhou represented USA in the 4th Korea Prime Minister Cup World Go championship in Jeonju, Korea and finished 5th place. 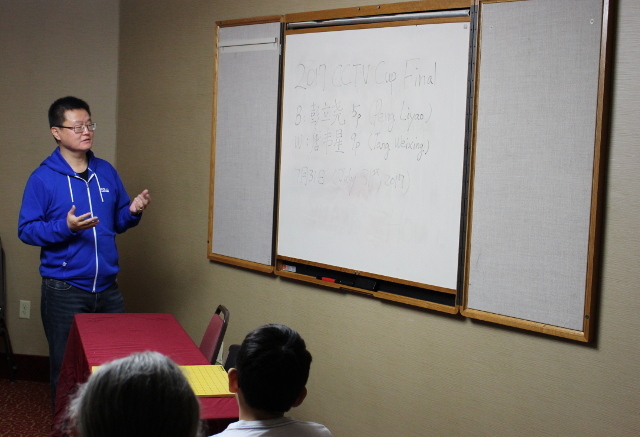 In addition to his competitive successes, Zhou has become a popular teacher and lecturer, frequently giving lectures and teaching lessons at various Go clubs in the eastern US region. He has also published many books at Slate & Shell (www.slateandshell.com). Zhou resides in Germantown, Maryland. Yuan Zhou is currently accepting new students. He offers private lessons, group lessons in person or on the internet. If you are interested in becoming Yuan Zhou's student and/or taking lessons from him and if you are a serious go player who wants to learn, improve and enjoy go, please contact him at yuan.zhou@zhouyuan.com. You can also see his website www.zhouyuan.com for more information.